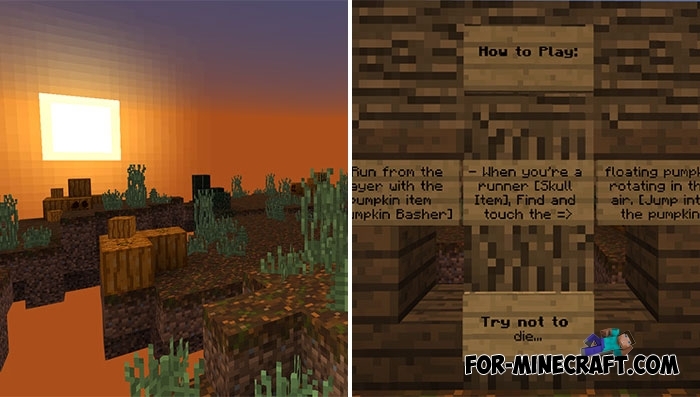 In anticipation of Halloween, install this Smack-o-Lanterns map and invite more players to arrange vigorous survival. This kind of survival is that you do not turn into a killer and find the very pumpkin, the October 31 symbol. There are no teams here and each player should only think about himself without paying attention to the others. If you become a bashers victim, then you will have nothing left but to attack the still-living players. The island for the main actions is quite miniature and contains unexpected traps, do not fall into them. Thus, you need to be always in motion and very often look under your feet as well as on the sides in order to find Jack-o’-lantern.